Please NEVER USE CHLORINE BLEACH in the SaniStride® System – it can possibly damage the mat and insert packet and void warranty. Contact your local janitorial supplier for a non-sudsing “concentrated” Quaternary shoe sanitizer or other non-chlorine based sanitizer that you will dilute with water… Using a concentrate and diluting it yourself is a very inexpensive alternative to using a ready to use Quat sanitizer. Your janitorial supplier can also advise you on how to maintain the potency of the sanitizer once it is exposed to air or contact the manufacturer for this information. 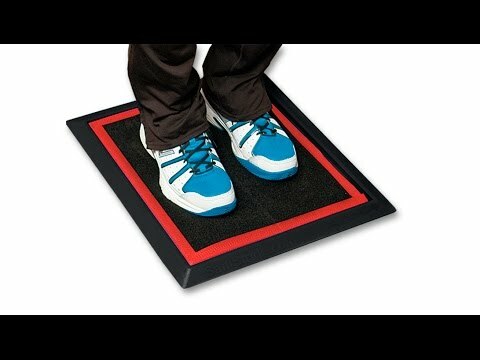 Please advise employees of the shoe sanitizer mat instillation and that because the Stride mat is 1” in height they must watch their step on entry to avoid tripping and falling until they get accustomed to using the mat. Also they must be informed of the slip factor from the wet shoe bottoms when exiting the mat… please provide a dry carpet to exit onto to wipe shoes dry. Dilute the Quaternary concentrate or other non-chlorine concentrate by mixing the specified quantity of concentrate with 1 gallon of water. Please follow dilution rates of the concentrated shoe sanitizer as per the manufacturer’s label on the container… typically a ratio of 1 ounce to 2 ounces of concentrate per gallon of water. Ready to use sanitizers (already diluted with water) can be added directly to the mat but are very expensive to use in the SaniStride® Systems. Set the STRIDE system on top of a 4’x6′ (recommended minimum size) or larger dry mat in the place where it is to be used. The dry mat will protect the flooring (wood, tile, carpet, floor wax) from any effects of prolonged exposure to the sanitizer as well as help prevent slipping and falls as the bottoms of the shoes will be very wet when exiting the STRIDE mat and will need to be wiped dry. 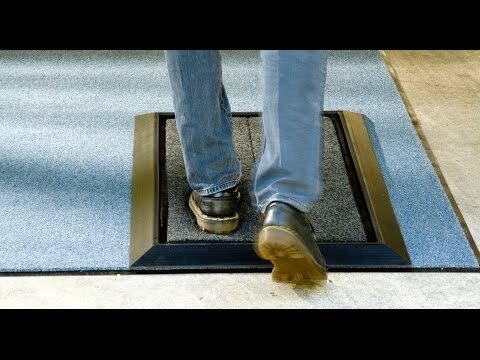 Alternatively, just place a smaller dry mat at the enter/exit side of the SaniStride® mat to dry shoes when floor finish is not a concern. The dry carpet pictured here is from Uline GO! sizes available range in size from 2’x3′ to 6’x10′. Dry mats can also be found at your local hardware Super Store. Pour 1/2 a gallon (64 ounces) of diluted sanitizer into the base-mat before laying the insert in place. Doing this helps to disperse the liquid quickly and evenly throughout the insert as you lay it into the base mat. Once insert is in place, pour the remainder of 1.25 – 1.5-gallon (maximum for the 1″ deep STRIDE sys.) and 108-114 ounces (maximum for the 1/2″ deep Stride LOW PRO sys.) onto the insert in-place. Alternatively the above quantities can be poured slowly onto the insert directly at the start of charging (this is the best way to charge the STRIDE RUNNER mat systems). It will then take a few minutes for the liquid to disperse throughout the entire insert. Do not overcharge the system (more than 1.5 gallons 1″ Stride and 120 ounce Low Pro), as doing so likely will cause splashing and overflow (over the base-mat walls) onto the floor. DUE TO EVAPORATION AND SHOE WICKING – the amount of sanitizer in the STRIDE systems will need to be assessed for proper saturation from day to day by noticing a slight puddle around the outside of the shoe sole when stepped on. If a puddle is not apparent, add at first a half quart and retest… add more until slight puddle reappears around sole being careful not to overcharge. ASK YOUR CHEMICAL SUPPLIER or MANUFACTURER – how long the sanitizer will be effective once exposed to air and the contact time necessary to achieve the effectiveness of the sanitizer. Adding sanitizer as needed day to day will assist in keeping up the potency of the chemical to a certain extent, but a complete clean out will need to be performed at regular intervals. RINSE INSERT WITH CLEAN WATER by hose or in a utility sink and stand on end to drip dry over night before recharging. DO NOT put the insert in a dryer or extractor as these machines will damage the insert. Dilute the Quaternary concentrate or other non-chlorine concentrate by mixing the specified quantity of concentrate with 1 gallon of water. Please follow dilution rates of the concentrated shoe sanitizer as per the manufacturer’s label on the container… typically a ratio of 1 ounce to 2 ounces of concentrate per gallon of water. Ready to use sanitizers (already diluted with water) can be added directly to the mat but are expensive to use. Set the SPORTS system on top of a 2’x3′ (recommended size) or larger dry mat in the place where it is to be used. The dry mat will protect the flooring (wood, tile, carpet, floor wax) from any effects of prolonged exposure to the sanitizer as well as help prevent slipping as the bottoms of the shoes will be very wet when exiting the SPORTS mat and will need a wipe. Slowly pour in 3-4 cups of diluted Quat sanitizer onto the insert. The insert will immediately absorb the liquid and hold it internally until delivering it to the shoe bottoms when stepped on. DUE TO EVAPORATION AND SHOE WICKING – the amount of sanitizer in the SPORTS system will need to be assessed for proper saturation from day to day by noticing a slight puddle around the outside of the shoe sole when stepped on. If a puddle is not apparent, add at first a half 1/2 cup and retest… add more until slight puddle reappears around sole being careful not to overcharge. RINSE INSERT WITH CLEAN WATER in a utility sink and stand on end to drip dry over night before recharging. DO NOT put the insert in a dryer or extractor as these machines will damage the insert. STRIDE LONG 1″deep & STRIDE WIDE 1″deep runner pieces each charge with 1.25 gallons of sanitizer. STRIDE LP Long 1/2″deep & STRIDE LP Wide 1/2″ deep runner pieces each charge with 114 ozs of sanitizer.